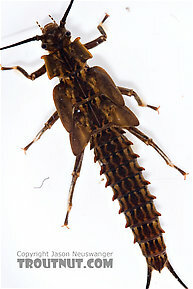 Stoneflies are the largest of the three main types of trout stream insects. While far less important than caddis and mayflies in the East and Midwest where they are mostly thought of as handy nymphs to imitate when nothing much is hatching, it's in the West where this order comes into its own. They can cause outstanding fishing, and on many rivers their hatches are the premier events of the season. The year begins with the little dark stoneflies of the Capniidae, Leuctridae, and Nemouridae families as some of the only active aquatic insects available to trout. As the year progresses into late Winter and early Spring, the Large Springflies of the Perlodidae family in the West and Willowflies of the Taeniopterygidae are sometimes the first dry-fly insects of the season. When Spring fully arrives, so do the most significant stoneflies for the angler - the gigantic Pteronarcyidae Salmonflies of western legend. The large Golden Stones of the Perlidae supplement these hatches and are more common across the country. Summer brings on significant hatches of the Little Yellow Stones of the Perlodidae family and the little yellow or green Chloroperlidae flies that are common sights. While there is some evidence to suggest that a few species in the West may emerge in open water, stoneflies largely owe their lesser status to a terrestrial (Terrestrial: Insects which live on land and are fed on by trout only when they incidentally fall into the water are known as "terrestrials" to fly anglers, and they're very important in late summer.) emergence style. This keeps them safe from trout at a stage when most mayflies and caddisflies are highly vulnerable. With few exceptions, they emerge by crawling out of the water onto rocks, sticks, or other shoreline objects. In some species the adult emerges from the nymph within inches of the water; others crawl quite a distance back into the woods. But this distinction matters little to the trout. In the East, populations of the larger species are sparser and their activity is most often nocturnal. This further reduces their importance to anglers, if not the trout. After emerging, the adults may live for up to a month. 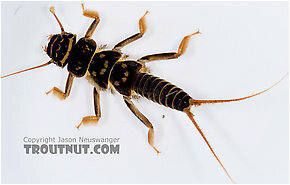 Like caddisflies and unlike mayflies, many stonefly species can eat and drink as adults. Stonefly adults are usually most important when laying their eggs after mating; particularly the larger species. Some drop their eggs from above the water but many either flutter along the surface or land on the water and create a commotion capable of drawing savage strikes from large trout during midday. 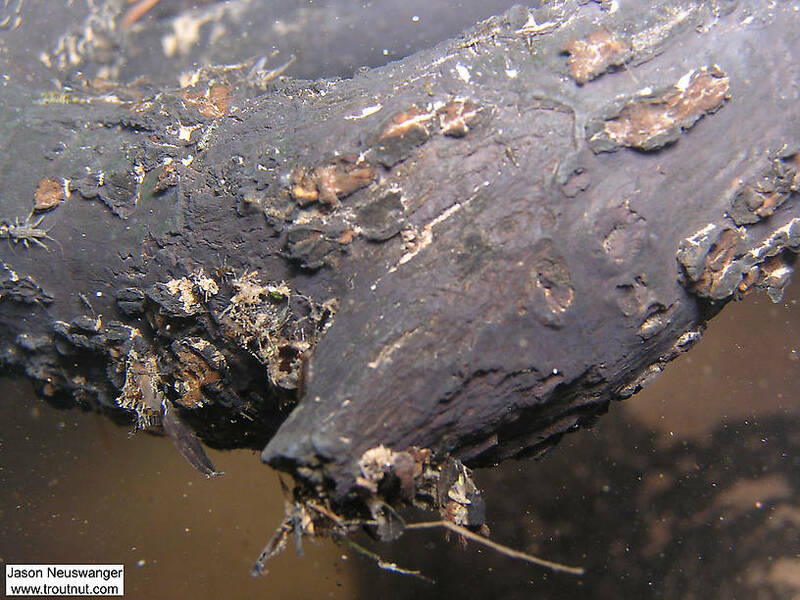 This behavior together with the broken surface of the water are reasons for the historic success of bushy, hair winged Sofa Pillow/Stimulator styles of dry flies. Stoneflies often fall spent (Spent: The wing position of many aquatic insects when they fall on the water after mating. The wings of both sides lay flat on the water. The word may be used to describe insects with their wings in that position, as well as the position itself.) after ovipositing and can gather in eddies or slack water in surprising numbers. Anglers will do well to to look for this, particularly early on Summer mornings. Be prepared with less bushy and flush floating flies to take advantage. Tarsus: The often multi-segmented outer leg section of an insect, which attached to the tibia.) which help them grip and clamber over fast-water rocks, and many of them have flattened bodies to make clinging even easier. Some species are better adapted to slow water, but they are not as common. 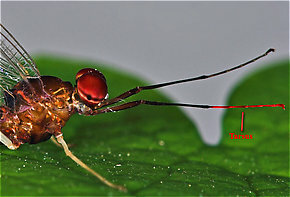 Although there are also plenty of small species, most of the largest insects in a trout stream are likely to be stonefly nymphs. They are poor swimmers, so when they occasionally slip into the drift (either by accident or during behavioral drift (Behavioral drift: The nymphs and larvae of many aquatic insects sometimes release their grip on the bottom and drift downstream for a while with synchronized timing. This phenomenon increases their vulnerability to trout just like emergence, but it is invisible to the angler above the surface. In many species it occurs daily, most often just after dusk or just before dawn.)) they are prime targets for trout. This makes stonefly nymph imitations popular and successful searching patterns (Searching pattern: Any artificial fly pattern used when trout that aren't feeding selectively on anything in particular. A searching pattern may be an attractor or an imitation of something specific that the fish might favor even though it's not currently hatching.) during non-hatch periods. 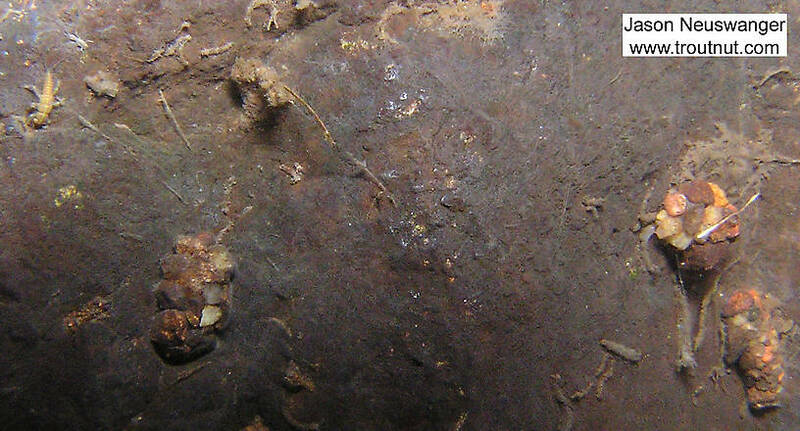 When the emergence of an especially abundant species is near, its nymphs may be so active and concentrated that trout feed on them selectively near the emergence sites. This is more common in the West where the cool, swift rivers draining its mountains hold remarkable stonefly populations. I have observed the Helopicus subvarians (springtime stonefly) for over 30 years on many of New Yorks Rivers, such as Beaverkill/Willowwemoc, Ausable (both east and west branch), West Canada Creek, and several others. Most of this time I believed it to be Acroneura nigrita ( Black Willow Stonely) as described by Ernest Schwiebert (Nymphs). Very distinct about the coloring of this Staonely is the last (rearward) sternites are very yellow (Ausable almost orange) while the riest is mostly black top and bottom. The thorax is again very distinctly marked with yellow (orange) with black on top. 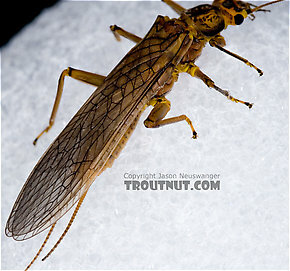 It is a most beautiflul stonefly, and is see it in May and June. It is well represented by the Montana Nymph is Black with yellow. I was just at my local river and the fish were pounding the surface. I was able to identify the fly on the water as a little green stonefly and am very interested in some good patterns to tie to imitate it. Any and all suggestions would be appreciated. There are 9 more topics.